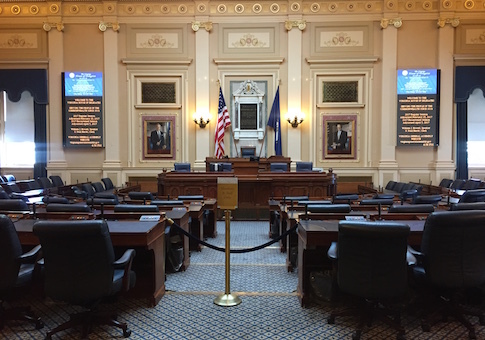 Two Republican-backed Virginia House bills to prevent an inadvertent $1.2 billion tax increase passed the House of Delegates Tuesday, a move proponents say will help middle-class Virginians. The legislation would also conform the state tax code to the federal tax code. The measures failed to pass Monday with an added emergency clause, which would have sped up the effective date. Although 12 Democrats voted with Republicans to pass the emergency clause Monday, the House Democratic minority was unified against Tuesday's legislation. "Since we rolled out our tax relief plan last month, Republicans in the House of Delegates have been unified in our efforts to use increased revenues from the federal tax law changes to provide tax relief to middle-class taxpayers," Speaker Kirk Cox, R-Colonial Heights, said in a news release. "Our plan guarantees that all money from the federal tax law changes are put in a lockbox and returned to taxpayers. I appreciate Chairman [Lee] Ware, Chairman [Tim] Hugo, and Chairman [Chris] Jones for their leadership on this important issue." Conformity to the federal tax code would ease the tax filing process for Virginians and help ensure more timely refunds. Although Democrats support their own conformity and voted to pass conformity legislation, the party opposes the tax relief Republicans attached onto it. Republicans have refused to sign onto a bill that does not include the tax cuts. A clause in the federal Tax Cuts and Jobs Act, supported by President Donald Trump and approved by Congress in December 2017, inadvertently raises the state taxes in Virginia despite lowering taxes throughout the rest of the country. Although Democratic Gov. Ralph Northam expressed excitement about the "tax windfall" that could allow for more spending, Republicans sought to reverse the state tax hike and inctead give the money back to the taxpayers. An extra $1.2 billion of tax revenue is expected to be collected by state government over its two-year budget period because of the federal government raising the standard deduction rate. This would increase Virginia's taxes because the state's tax code requires that residents claim the same state and federal tax status – and Virginia’s deduction rate is much lower. This will lead to many Virginians itemizing less, creating the tax increase. To avoid this, the Republican-backed House Bills 2529 and 2355 would remove the requirement for Virginians to claim the same federal and state tax status. Additionally, the legislation would increase the state’s standard deduction rate for individuals from $3,000 to $4,000 and for a married couple from $6,000 to $8,000, adding more tax relief for Virginians, similar to the Tax Cuts and Jobs Act. Democrats have criticized Republicans for pushing a bill that is similar to the Tax Cuts and Jobs Act and said that this bill would help the wealthy more than the working class, who Republicans claim are being helped by it. "Throughout session, House Democrats have advocated for tax relief for working class families who are often forgotten in Washington and Richmond," Kathryn Gilley, a spokesperson for the House Democrats, said in a news release. "It’s unfortunate that the House Republicans are bound to perpetuate the reckless Trump policy that disadvantages low- to moderate-income Virginians." Republicans have a slim majority in the Senate, but for the bill to become law, Northam would have to sign it. Northam, who is facing calls from both parties to resign over revelations of a racist photo on his medical yearbook page, and the Democrats have voiced support for the increased tax revenue.